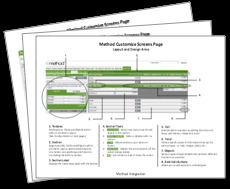 The Design Mode is where you are able to customize every screen in Method. Unlike other areas in Method, the Design Mode is a different way to view and interact with the mechanics of how the screen functions. Think of it as taking a look under the hood of a car – this is where the nuts and bolts of how a screen operates can be seen and modified. There are two ways to get to the Design Mode of a screen. Right-clicking on the screen and clicking Customize. Navigating to Customize > Screens and clicking on the screen you wish to customize from the list. In the first option, you will be notified that you're creating and customizing a copy of the screen which can later replace the current version. In the second option, you can click either on edit or copy and edit to the left of the screen you want to choose. Once there, you are presented with a wide variety of options. For a full layout of what the Design mode looks like, and a detailed list of what each element of the screen does, check out this PDF.